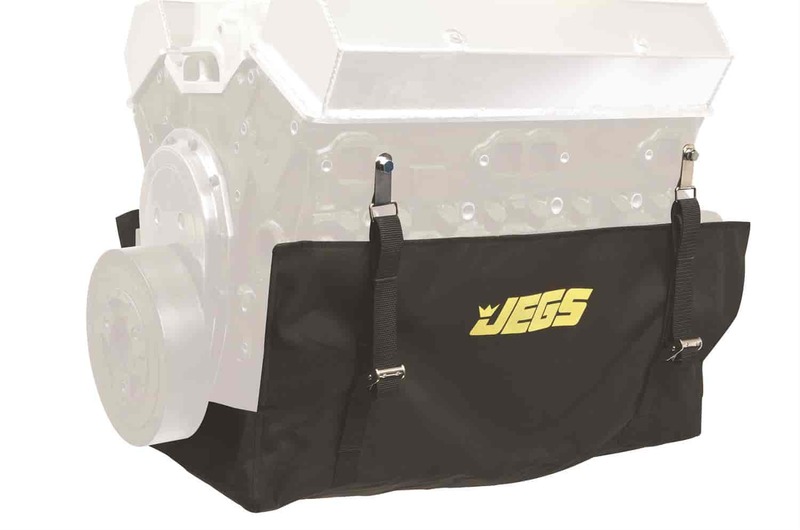 JEGS Universal Engine Diaper is NHRA Sportsman accepted for competition; however, it is not SFI approved. Fits 6 to 10 quart wet sump systems. The engine diaper assembly includes pad, front & rear straps, and mounting hardware. Replacement pads available separately. 50210 is rated 4.4 out of 5 by 14. Rated 5 out of 5 by Sneaky Pete 1949 from engine diaper Much easier than diapers I have used in the past. By far lighter and easier to install than str---. thanks for a products that is user friendly. Rated 4 out of 5 by hotrodg726 from fits OK for what it is. there should be one available that has a fitment for a rear sump pan like 80% of the sportsman racers use. and the buckle in the pass side by the starter should be mounted bu the very botton on the right side so it is not buried under the starter. it does the job and is cheap so it is good in that sense. Will it fit Ford front sump pan? Yes, this will fit most oil pan combinations. How does it hold up touching a header tube? It can't handle direct heat but can handle up 2000&deg; of radiant heat. Do you need a flexplate cover when using a diaper??? It is recommended, but not required. Yes, this will fit most oil pan designs. JEGS 50211 - Engine Diaper Replacement Pads Measures 30" x 15"